Ongoing, rapid advancements in sensor and communication technology have provided decision makers in a variety of fields with unprecedented quantities of (nearly) real time data. This has prompted new questions about how to optimally process this data and rapidly integrate it into transportation and logistical models. 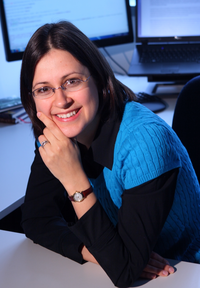 Professor Dolinskaya studies adaptive decision making in logistics, specifically in the areas of humanitarian logistics, electric vehicle routing and vessel navigation. 1. In-depth analysis of domain specific problem structures to derive properties (such as analytical solution for a subproblem or necessary condition for optimality) that reduce the state space and/or decision space of the problem to be solved. 2. Development of efficient solution approaches, often heuristics motivated by the derived properties of the problem structure, which can solve larger and more comprehensive problem models in sufficiently small amount of time to guaranty timely implementation. See my Webinar to learn what I do in terms that a middle schooler can understand!